Source: Spiewak R. Occupational dermatoses among Polish private farmers, 1991-1999. Am J Ind Med 2003; 43 (6): 647-655. Background: Little is known about work-related skin diseases among Polish self-employed farmers. In the National Register of Occupational Diseases, private farmers are placed in one category together with other agricultural workers, despite fundamental differences in compensation legislation and separate insurance institutions. The Agricultural Social Insurance Fund reports only on numbers of compensated cases. The aim of this study was to create reliable statistics on occupational dermatoses among private farmers. Methods: All cases of work-related skin diseases diagnosed from 1991 to 1999 were included in the statistics. Compensation records of the Agricultural Social Insurance Fund were analyzed for diagnoses, causative factors, and health impairment of the skin. Results: The first occupational dermatosis was registered in 1992. Until the end of 1999, there were 101 cases (63 women and 38 men). The incidence rose from 0.006/10,000/year in 1992 to 0.189/10,000/year in 1999. Allergic contact dermatitis was the most common diagnosis (86%), followed by infectious skin diseases (10%), irritant contact dermatitis (3%), and urticaria (2%). The most frequently identified causative factors were plant dusts (38%), animal allergens (36%), metals (29%), pesticides (18%), and rubber chemicals (15%). The median impairment due to skin disease was 20% (range 2-36%). Conclusions: Since the introduction of workers' compensation, the numbers of occupational dermatoses diagnosed in Polish private farmers have increased rapidly. However, compared to countries with a longer experience in this field, these figures remain low, probably due to low detection of these diseases. Key words: occupational dermatoses, agriculture, private farmers, Poland, causative agents, clinical pictures, new insurance system, compensation registry, statistical analysis. At their workplace, farmers are exposed to a wide variety of substances, such as plant and animal allergens, microorganisms, and pesticides, which may provoke occupational skin disease [reviewed in Susitaival, 2000]. Of all industry branches in the United States, agriculture has the highest rate of occupational dermatitis causing days away from work [Burnett et al., 1998]. In Washington State between 1989 and 1993, the rate of accepted occupational skin disease claims in agriculture was 28/10,000 full-time employee-years [Kaufman et al., 1998]. 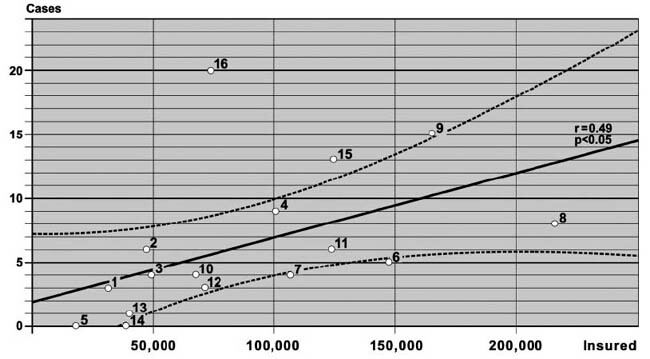 In Finland, the incidence in 1994 amounted to 16/10,000/year. Of all occupational dermatoses in Finland, 22% were those among farmers, despite the fact that they constituted only 7% of workforce [Susitaival, 1996]. In 1990, there were in Poland 4.4 million people employed in agriculture. Among them, only 0.7 million employees of state-owned farms were insured against occupational diseases [Central Statistical Office, 1991]. The incidence of occupational skin diseases in this group was 0.59 cases/10,000/year, compared to the mean of 0.74/10,000/year for all economy branches [Indulski et al., 1991]. At that time, private farmers were not included in the workers' compensation system. This situation changed in 1991 when the Agricultural Social Insurance Fund (KRUS) was separated from the general insurance institution, and the legal basis for compensation of occupational diseases in private farmers was laid down. Since then, insurance against occupational accidents and diseases is compulsory for all occupationally active farmers. As the Agricultural Social Insurance Fund has been generously subsidized by the state (farmers pay only ca. 10% of the insurance costs), almost all private farmers decided to change from the general social insurance to the new institution. In 1999, the fund was providing social insurance to approximately 3.7 million farmers and their family members [Central Statistical Office, 2000]. Among them, 1.4 million occupationally active farmers were insured against work-related accidents and diseases [Daszewski, 2000]. With increasing numbers of work-related skin diseases in private farmers, the lack of statistics on their causes and risk sources became apparent. The Polish National Register of Occupational Diseases since 1995 has coded worker's occupation according to the European Classification of Activities (NACE) [European Commission, 1993]. The code NACE 01.30 lists "growing of crops combined with farming of animals (mixed farming)." This category does not differentiate between private farmers and other agricultural workers despite different employment status and the separate insurance institution. As a result, this register is of little help when observing private farmers. Also compensation statistics published by the Agricultural Social Insurance Fund  have limited value due to scarcity of information on clinical diagnoses and the total lack of data on causative factors and extent of impairment caused by occupational disease. Moreover, delays between the diagnosis of occupational disease and its compensation may last for several years if a farmer is not satisfied with the proposed amount and begins legal action. Such cases remain outside compensation statistics until the court's sentence. The above illustrates that there is limited use of official statistics when observing occupational dermatoses in Polish self-employed farmers. The present study was therefore undertaken in order to gain reliable data. According to Polish law, occupational disease is diagnosed if the two following criteria are met: (1) the disease was caused by pathogens present at the workplace, and (2) the diagnosis is on the official list of occupational diseases. "Skin diseases" appears on the list, without any further specifications or limitations. The selection of procedures to prove the causality depends on the diagnosing expert. A broad spectrum of tactics is applied by various doctors: some use many tests (bacterial and fungal cultures, skin prick tests, patch tests, in vitro allergy tests), and consider almost every positive test result as proof of the causality. On the opposite side are those who are of the opinion that a patient's history alone is sufficient for the diagnosis. This diversity of diagnostic strategies unavoidably influences the quality of analyzed data. Moreover, many Polish doctors refuse to accept irritant contact dermatitis as an occupational disease, which may result in underdiagnosis of such cases. This problem will be further elaborated on in the Discussion. Once the diagnosis of occupational disease is established, it is reported to the local State Sanitary inspector for verification and final approval. The inspector issues a certificate, which is sent to the Agricultural Social Insurance Fund. Finally, an insurance physician examines the farmer in order to assess the impairment caused by the disease. In order for compensation to be granted, the impairment must be regarded as permanent or long lasting (persisting for more than 6 months). The magnitude of impairment is expressed as a percent. There are official tables with minimal and maximal percentages for particular diagnoses, resembling those of the American Medical Association [Taylor, 1994]. For noncancer dermatoses, impairment of the skin may be scored from 0 to 44% depending on the gravity of the disease and surface involved. Compensation registers of the Agricultural Social Insurance Fund of Poland were searched for all occupational diseases diagnosed until the end of 1999. From this list, cases of skin diseases were selected and copies of the respective files were borrowed from the local offices of the institution. These files were assessed by a dermatologist in order to retrieve all medically relevant data. Special attention was paid to clinical diagnosis, localization of skin changes, identified causes of the disease, duration of exposure, and impairment of the skin. As already mentioned, physicians diagnosing occupational diseases in Poland enjoy a relatively large degree of freedom in choosing procedures to prove causality. There are also no regulations determining what kind of information is required on occupational diseases. For example, in most compensation records, there was no information on the starting date of the occupational disease. This diversity of reported information was the major difficulty during data collection. Certificates issued by the State Sanitary inspectors were to some extent more unified. Therefore, the cases were ordered for further analyses according to the certificate dates. Insurance physicians use standard forms, therefore, no problems with collecting data on impairment of the skin were encountered. Data retrieved from the documentation were coded for further statistical analysis, which was carried out with the use of the Statistica forWindows 5.1 PL software (StatSoft, Inc., Tulsa, OK). Numbers of newly diagnosed cases of occupational dermatoses in subsequent years were compared with data from the National Register of Occupational Diseases and compensation statistics of the Agricultural Social Insurance Fund. Additionally, descriptive statistics were produced of clinical diagnoses, identified causes, and impairment of the skin caused by work-related dermatoses in farmers. Correlation coefficients between numbers of insured farmers and occupational skin diseases diagnosed in all 16 Polish provinces were also assessed. Finally, in order to find possible interregional differences, mean incidences were computed for these provinces. This was produced by dividing the number of cases registered from 1991 to 1999/10,000 occupationally active farmers in each province per year. The first case of occupational skin disease in a Polish private farmer was registered in 1992. Table I presents numbers of cases diagnosed in subsequent years. It also presents differences between the results of this study and data from official statistics. The biggest discrepancies are for 1996, when nine cases of occupational dermatoses were diagnosed in private farmers. In contrast to this, there were 29 cases in the National Register of Occupational Diseases assigned to the European code NACE 01.30 "mixed farming," while the Agricultural Social Insurance Fund reported on 11 private farmers compensated for occupational dermatoses in that year. The mean incidence of occupational dermatoses among Polish farmers from 1991 to 1999 was 0.08/10,000/year. 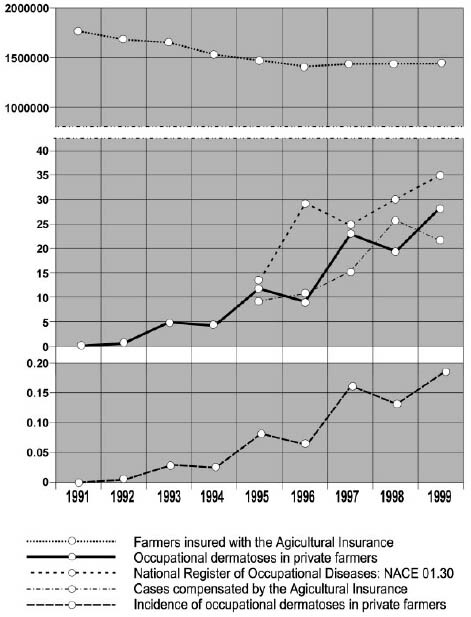 There was a clearly increasing trend in the incidence rates, which rose from 0.006 new cases per 10,000 insured farmers in 1992 to 0.189/10,000 in 1999 (Fig. 1). At the end of 1999, 101 farmers with acknowledged occupational skin diseases were registered: 63 women and 38 men aged 36-71 (median 44) years. Information on the duration of employment was available regarding 67 persons. They had worked on farms from 7 to 57 (median 23) years. Only in the files of nine farmers was there information on the disease's duration before diagnosis: in these cases it lasted from 7 to 15 (median 9) years. The permanent impairment of the skin caused by occupational dermatoses as certified by the insurance experts ranged from 2 to 36%, median 20%. Geographical distribution of the diagnosed cases is shown in Figure 2. There was a correlation between numbers of insured farmers and occupational diseases diagnosed in each province (r=0.49, P<0.05). Mean incidence in particular provinces ranged from 0 to 0.30/10,000/year. The highest number of cases and incidence of occupational dermatoses in self-employed farmers were found in Podkarpackie province, a predominantly rural district in southeastern Poland (No. 16 in Figs. 2 and 3). Details of the dermatological diagnoses are shown in Table II. The most common occupational disease was allergic contact dermatitis (87 of 101 farmers, among them 55 cases of hand dermatitis). Infectious skin diseases (10 cases) included one case, in which two occupational skin diseases (contact dermatitis and candidiasis) were present. 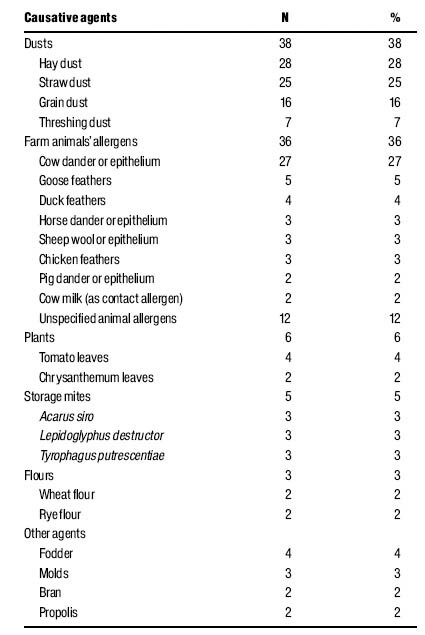 Table III lists animal and plant allergens identified as causes for occupational allergic contact dermatitis in farmers. In the majority of cases, organic dusts (mainly hay, straw, and grain dust) and animal substances (mainly cow dander and epithelium) were identified as causative factors. 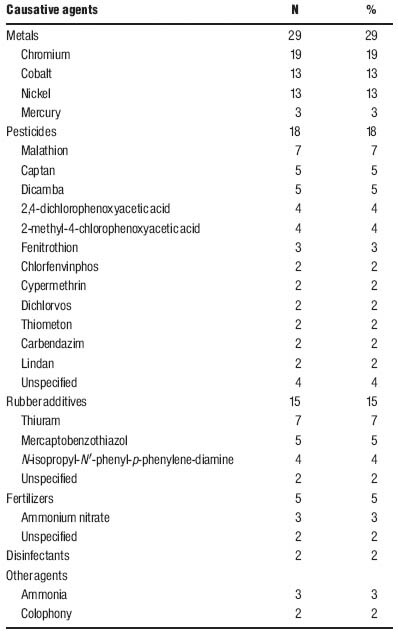 Occupational skin diseases caused by metals (mainly chromium), pesticides (primarily malathion), and rubber additives were also relatively frequent (Table IV). Since compensation for occupational disease was introduced for private farmers in Poland, there has been a constant increase in the incidence of occupational dermatoses. As previously mentioned, these rates still remain far below the figures for other kinds of employment in agriculture, as well as for other sectors of industry in Poland. In the author's opinion, this is mainly due to insufficient detection - there are no compulsory entrance medical examinations and prophylactic health checks for private farmers. When analyzing separate Polish provinces, the highest number of diagnosed cases and incidence were found in Podkarpackie province. There may be various explanations for this, from the poorer health condition of the farmers, to a better awareness of farmers' occupational diseases among local doctors. Judging from the quality of medical records, the latter explanation seems more probable. Epidemiological surveys indicate that in fact skin diseases are common among Polish private farmers. In a recent questionnaire-based study, work-related skin symptoms were reported by 25% of 145 surveyed farmers [Spiewak, 2001a]. In another study, 19% of 73 farmers complained of skin symptoms related to work on the farm [Spiewak et al., 2001]. Most of these complaints were mild and did not limit the farmers' working ability; however, invalidating cases have also been found in these groups. Women prevailed among farmers with occupational dermatoses. They made up 62% of cases in the analyzed group, despite the 1:1 ratio of genders among self-employed farmers in Poland [Central Statistical Office, 2000]. A similar pattern was also observed in other countries. Among Finnish farmers, the 1-year prevalence of self-reported hand dermatoses was 16% in women and 7% in men [Susitaival et al., 1994]. In Iowa, 14.4% of farmers' wives complained of dermatitis compared to 9.6% of male farmers [Park et al., 2001]. In a study of New Zealand farmers, skin allergies were also more frequent in women (odds ratio 1.9) [Kimbell-Dunn et al., 1999]. This may suggest that the female gender is a risk factor for occupational skin disease. One of the study goals was to compare produced data with the official register of occupational diseases and the compensation reports of the farmers' insurance institution. As mentioned above, occupations in the National Register of Occupational Diseases are coded according to the European Classification of Activities (NACE). The code NACE 01.30 ("growing of crops combined with farming of animals - mixed farming") is usually regarded as representative for private farming. However, the present study shows relevant differences between numbers of occupational diseases assigned to NACE 01.30 and those actually occurring among self-employed farmers. Since 1995, compensation statistics of the Agricultural Social Insurance Fund are also available. In contrast to the National Register of Occupational Diseases, they include exclusively self-employed farmers. However, these statistics reflect the numbers of cases compensated each year and not of those diagnosed; moreover, there is no information on causes and impairment of the skin. None of official statistics reliably reflects the situation of occupational dermatoses in private farmers. This is mainly due to different aims and methods of data collection. It is difficult to imagine an effective prevention program without good data on causes and risk factors. Therefore, there is a need for continuing separate statistical analyses of occupational dermatoses among private farmers, or adjusting the occupation codes of the National Register of Occupational Diseases for this purpose. Plant dusts were the most often mentioned causes of occupational dermatoses in Polish farmers (38%). This is in accordance with previous epidemiological surveys. Among 145 eastern-Polish farmers, work-related skin symptoms caused by exposure to plant dusts were reported by 24% [Spiewak, 2001a]. In another group of farmers, skin symptoms caused by contact with plants were reported by 19% [Spiewak et al., 2001]. On California crop farms, 39.5% cases of skin diseases causing work-time loss were also attributed to plants; however, the most common cause was poison oak, which does not exist in Europe [O'Malley and Mathias, 1988]. In Poland, the main causative factor is dust of cultivated crops (hay, grain, and straw), probably due to heavy exposure of the farmers to dust. Yet another difference between both statistics must be kept in mind - the California statistics include all suspected cases, while data presented in this paper include only diagnosed cases with permanent impairment of the skin. Among animal allergens, cow dander and epithelium were the most important causative factors, indicated in 27% of cases. Similar figures were observed in Finland, where cow allergens were responsible for 28% of occupational dermatoses in farmers [Susitaival, 1996]. Sensitization to cow allergens is relatively common among Polish farmers. In a group of randomly selected 68 farmers, 7% reacted to cow epithelium on skin prick tests, and 9% had specific IgE to cow dander [Spiewak, 2001c]. None of these farmers complained of any symptoms when working with cows, which shows that sensitization to workplace allergens is not equivalent with occupational disease. In the previously mentioned group of 145 farmers, only 2 (1.4%) complained of skin symptoms that were provoked by contact with animals [Spiewak, 2001a]. Sensitization may, however, precede the disease, as observed previously in a serological study of cow breeders [Spiewak et al., 2000]. A farmer with IgE specific to cow epithelium at the time of the study complained only of conjunctivitis when working in cowsheds. A year later, he also contracted contact dermatitis of the hands caused by allergy to cow epithelium. Pesticides are well-known causes of farmers' occupational dermatoses [Spiewak, 2001b]. In the analyzed period, 18% of occupational dermatoses in Poland were attributed to pesticides. A similar rate was observed in California (20%) [O'Malley and Mathias, 1988] and a higher rate (40%) in New Zealand [Rademaker, 1998]. Skin infections accounted for 10% of analyzed cases. From this, only five cases were caused by zoophilic dermatophyte infection. This is in accordance with results of a recent study of 116 Polish farmers treated for fungus, among whom only three cases of zoophilic infections were found - all caused by Trichophyton verrucosum [Spiewak and Szostak, 2000]. Apparently, fungal infections transmissible from animals are rare nowadays, while in the 1960s they were the most frequent work-related skin diseases among Polish farmers [Stefanska-Tuderowicz, 1967]. This change illustrates the impact of veterinary surveillance of cattle on farmers' health. Only three cases of occupational irritant contact dermatitis (ICD) were diagnosed in Poland between 1991 and 1999. This number is surprisingly low considering the fact that ICD is recognized as the most common occupational skin disease [Goldner, 1994]. Farming does not differ from this general pattern; milking is especially associated with a high risk of ICD. In 1980s, as many as 89% of German milkers had symptoms of irritant contact dermatitis [Heise et al., 1983]. The low number of ICD cases diagnosed among Polish farmers is most probably due to the fact that quite a few Polish doctors believe that irritant contact dermatitis should not be regarded as occupational disease. Disregarding the clear legal regulations and opinion of authorities on occupational dermatology, this point of view is still being transferred from old doctors to their younger colleagues. It has already been suggested in this article that only a relatively small portion of occupational dermatoses in Polish private farmers are diagnosed and receive compensation. Certainly, doctors' misbeliefs only add to the difficulty of detecting irritant contact dermatitis. FIGURE 1. Trends in occupational dermatoses among private farmers in Poland, 1991-1999. Code NACE 01.30 of the European Classification of Activities reads "growing of crops combined with farming of animals (mixed farming)". Incidence rate is expressed as number of new cases per 10,000 occupationally active private farmers per year. FIGURE 2. Geographical distribution of cases diagnosed from 1991-1999 and numbers of insured farmers (as of 1999) in particular provinces of Poland. Each dot denotes1case of occupational skin disease. Provinces are numbered as follows: 1-Zachodniopomorskie, 2-Pomorskie, 3-Warminsko-Mazurskie, 4-Podlaskie, 5-Lubuskie, 6-Wielkopolskie,7-Kujawsko-Pomorskie, 8-Mazowieckie, 9-Lubelskie, 10-Dolnoslaskie, 11-Lodzkie, 12-Swietokrzyskie, 13-Opolskie, 14-Slaskie, 15-Malopolskie,16-Podkarpackie. FIGURE 3. Correlation between numbers of insured farmers and cases diagnosed in particular provinces of Poland. Numbers at each point denote provinces as on map (Fig.2).Dashed lines delimit 95% confidence interval for the regression line. Self-employed farmers in Poland are a specific occupational group due to the separate insurance institution and limited access to occupational safety and health services. Official statistics, both the National Register of Occupational Diseases and the compensation reports of the Agricultural Social Insurance Fund, are unsatisfactory sources of data on occupational dermatoses in private farmers. The vast majority (86%) of farmers' occupational skin diseases is made up of allergic contact dermatitis while irritant contact dermatitis seems to be underrepresented. Plant dusts, followed by animal allergens, metals, pesticides, and rubber chemicals are the most important causes of occupational dermatoses in this group. The author thanks Dr. Jacek Kossakowski and Dr. Wojciech Kobielski for permission to access the compensation records of the Agricultural Social Insurance Fund in Warsaw, Poland. Special thanks go to Mrs. Jadwiga Groch for collecting copies of compensation records from local offices of the institution. Data from the National Register of Occupational Diseases on skin diseases assigned to the European code NACE 01.30 were supplied by Mrs. Danuta Droszcz, by kind permission of Professor Neonila Szeszenia-Dabrowska of the Nofer Institute of Occupational Medicine in Lodz, Poland. Agricultural Social Insurance Fund. 2000. Accidents at work and occupational diseases in farmers and preventive actions in 1999. Warsaw: Kasa Rolniczego Ubezpieczenia Spolecznego. 79 p (in Polish). Burnett CA, Lushniak BD, McCarthy W, Kaufmann J. 1998. Occupational dermatitis causing days away from work in US private industry, 1993. Am J Ind Med 34:568-763. Central Statistical Office. 1991. Statistical yearbook 1991. Warsaw: Zaklad Wydawnictw Statystycznych. 596 p (in Polish). Central Statistical Office. 2000. Statistical yearbook of the Republic of Poland 2000. Warsaw: Zaklad Wydawnictw Statystycznych. 722 p.
Daszewski K. 2000. Mean numbers of insured. Ubezpieczenia w Rolnictwie (4):172 (in Polish). European Commission. 1993. Commission Regulation (EEC) No 761/93 of 24 March 1993 amending Council Regulation (EEC) No 3037/90 on the statistical classification of economic activities in the European community. Off J L 083 1-24. Goldner R. 1994. Work-related irritant contact dermatitis. Occup Med 9:37-44. Heise H, Kirschnick S, Dobreff U. 1983. Irritant dermatitis in agriculture. Dermatol Monatsschr 169:625-630 (in German). Indulski JA, Starzynski Z, Kaczmarek T. 1991. Occupational diseases in Poland in the years 1988-1990. Lodz: Institute of Occupational Medicine. 34 p.
Kaufman JD, Cohen MA, Sama SR, Shields JW, Kalat J. 1998. Occupational skin diseases in Washington State, 1989 through 1993: Using workers' compensation data to identify cutaneous hazards. Am J Pub Health 88:1047-1051. Kimbell-Dunn M, Bradshaw L, Slater T, Erkinjuntti-Pekkanen R, Fishwick D, Pearce N. 1999. Asthma and allergy in New Zealand farmers. Am J Ind Med 35:51-57. O'Malley M, Mathias CGT. 1988. Distribution of lost-work time claims for skin disease in California agriculture: 1978-1983. Am J Ind Med 14:715-720. Park H, Sprince NL, Whitten PS, Burmeister LF, Zwerling C. 2001. Farm-related dermatoses in Iowa male farmers and wives of farmers: A cross-sectional analysis of the Iowa farm family health and hazard surveillance project. J Occup Environ Med 43:364-369. Rademaker M. 1998. Occupational contact dermatitis among New Zealand farmers. Australas J Dermatol 39:164-167. Spiewak R. 2001a. Skin diseases related to farm work - a questionnaire survey of 145 farmers in Lublin Province. Post Dermatol Alergol 18:194-199 (in Polish). Spiewak R. 2001b. Pesticides as a cause of occupational skin disease in farmers. Ann Agric Environ Med 8:1-5. Spiewak R. 2001c. Sensitization to cow and pig allergens among farmers in Eastern Poland. Med Pr 52:351-354 (in Polish). Spiewak R, Szostak W. 2000. Zoophilic and geophilic dermatophytoses among farmers and non-farmers in eastern Poland. Ann Agric Environ Med 7:125-129. Spiewak R, Dutkiewicz J, Skorska C. 2000. Detection of specific IgE as a screening tool for cow and swine breeders' occupational allergic dermatoses. Ann Agric Environ Med 7:145-147. Spiewak R, Gora A, Dutkiewicz J. 2001. Work-related symptoms and type I allergy among eastern-Polish farmers growing hops and other crops. Ann Agric Environ Med 8:51-56. Stefanska-Tuderowicz G. 1967. Epidemiology of deep-seated trichophytosis in northeastern Poland. In: Chmel L, editor. Recent advances of human and animal mycology. Bratislava: SAV Publishing House. p 165-167. Susitaival P. 1996. Epidemiological study of hand dermatoses and other skin diseases in a cohort of Finnish farmers. Thesis. Kuopio: Kuopio University. 168 p.
Susitaival P. 2000. Occupational skin diseases in farmers and farm workers. In: Kanerva L, Elsner P, Wahlberg JE, Maibach HI, editors. Handbook of Occupational Dermatology. Berlin: Springer Verlag. p 924-931. Susitaival P, Husman L, Horsmanheimo M, Notkola V, Husman K. 1994. Prevalence of hand dermatoses among Finnish farmers. Scand J Work Environ Health 20:206-212. Taylor J. 1994. Evaluation of impairment due to work-related skin disease. Occup Med 9:1-9. © Wiley-Liss, Inc. Source © Radoslaw Spiewak (contact). Document created: 27 July 2006, last updated: 1 September 2006.